At 36″ by 11″, this is a rather small neon porcelain sign. 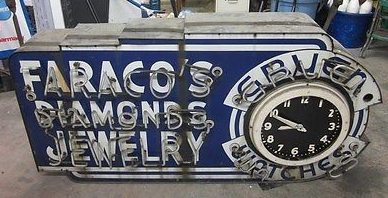 The Farco’s Diamonds and Jewelry sign has a clock to the right that also sports some neon lighting. Overall, the sign is blue and white with a lot of good character.